Leveraging on our industrious workforce, we deal in the service providing of Pens. Pens are not only writing tools but also have become a statement of style in the current scenario. Keeping this thing in mind, these pens are developed by our experts who also give several services on it such as replacement guarantee and solving the client doubts related to this equipment. These services have been hailed by the industry experts and are utilized by the clients. 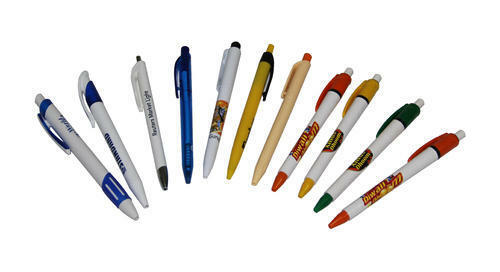 Pens can be medium of low-cost advertisement that is highly effective with your company logo printed. Being the reckoned Manufacturer, Trader & Service Providers "Super Creative Graphic Services Private Limited" established in the year 2004 has carved a niche by offering best quality Corporate Gifts, Diwali Gifts & Gift Box Printing. These services are planned and executed under the supervision of experienced staff, so that chances of flaws are reduced to minimum. We are also offering T-Shirt, Mug Printing Services, USB Drive, Gift Packaging Services, Carton Gift Box Printing Services, Corporate Gift Box Printing Services, Umbrellas Services, Sipper Bottles Services, Photo Frames Services and many more. We keep the price of our services minimum as compared to the price prevailing in the market, so that customers do not face any problem. Our team has played a vital role in making us the reckoned names in industry. These professionals are highly experienced and ensure that the work assigned to them is accomplished in timely manner. Our team is highly efficient and very well aware of their responsibilities.